The RCN and Public Health England (PHE) are urging students starting university to protect themselves against meningitis before the start of term. Colleges and universities are hotspots for the bacteria that causes the disease, PHE said, and new students should ensure they have been vaccinated. RELATED: Medicines management: How can I encourage uptake of the meningitis vaccine? The combined MenACWY vaccine protects against strains including group W meningococcal disease (Men W). The RCN said those starting at university should be vaccinated this month, to give time for immunity to build up before freshers' week. PHE consultant paediatrician Shamez Ladhani said: 'We know colleges and universities can be hotspots for the spread of meningococcal disease. 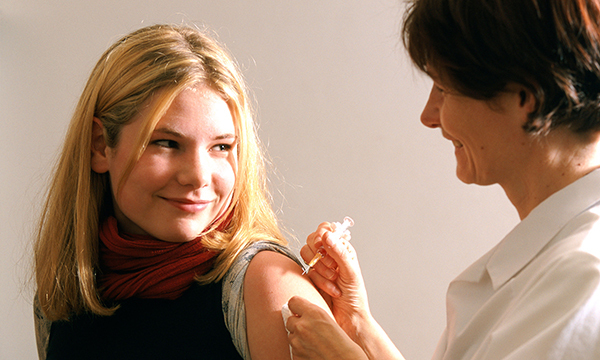 The combined MenACWY vaccination was introduced in 2015 in response to a large increase in infections caused by Men W.
RCN professional lead for public health Helen Donovan said: 'Freshers are more at risk from meningitis W, a particularly nasty strain that can kill, or leave people with life-changing disabilities. 'Vaccination offers protection against most strains of the disease, and it's quick, easy and free, but they need to contact their GP in good time. The number of cases of meningitis and septicaemia caused by Men W rose from 22 in 2009-10 to 225 in 2016-17, PHE figures show. Provisional figures for 2017-18 show the first decline since 2009, with numbers dropping to 192. The greatest drop in cases last year was among young people in the 15 to 19 years age group. Dr Ladhani said: 'We need eligible people to keep getting the vaccine every year to ensure this downward trend continues.